Carrying on their tradition of giving us superior gaming machines like the Nine Hundred, Antec has upped the ante once more and added not one, but TWO whole digits into the mix....giving us the Antec Nine Hundred Two Case. The Nine Hundred Two offers devoted PC gamers a truly unsurpassed enclosure. That's right, this bad boy delivers a one-two punch of cooling, convenience, and unparalleled performance. This thing doesn't just tower above the competition, it occasionally picks them up with it's giant fists and gnaws repeatedly on their shrimpy little heads until it bores of them. 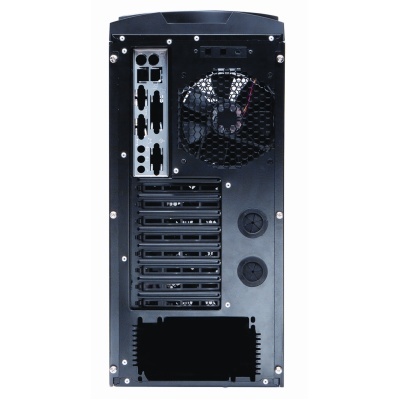 Building on the design of it's original namesake, the Antec Nine Hundred Two offers improved airflow through it's ventilated front-end and a highly intimidating style that's highlighted by a impressively contoured side window. Add front-speed controlled LED Fans and a 200mm TriCool LED Exhaust Fan to the top, and you have yourself a machine that will make you a truly indomitable force to be reckoned with. Material: Black Steel Dimensions: 19.4" x 8.6" x 18.6"